It is time to bloom, recharge and grow! I am expanding on my creative aspirations, rejuvenating my businesses, feeding the artist in me and hopefully inspiring you along the way. So I say welcome, I am glad you are here and have found my creative blog! It’s live, however bare with me as I get things up and running. Stop by again and know great things are in store and to be shared! I am excited to start this blog and my new endeavors. Well, I guess you can’t quite say they are new, I’m just finally making the time for them. I have learned this past year about just how precious time is, my perception of a few things have changed. Maybe it is the age I am now (late 30’s…yikes, how did that happen) or through the loss of my Dad in November, he was only 58. A Sweet Life Designed has been on my mind for the last few years…yikes, yes, I said years. I’ve realized that it’s way to long to not being doing something that my heart has been craving. I’ve wanted, and need to get back to creating and connecting in a deeper form. The artist in me has been screaming and I am finally ready to listen. Maybe some of you can relate. I am choosing (this can be a hard one when time is of the essence) to make the time to work on and share projects I love. So what exactly is A Sweet Life Designed? The short answer is this space will be an outlet for creative entrepreneurs and small business owners to gather. While you’re here I hope you learn something new and get inspired through the sharing of projects, resources, interviews, recipes, stories and tips I’ve learned over the years through running my own businesses while striving for more. I have been so super focused building my business that I forgot to stop and recharge my batteries along the way. I remember my art instructors from college taking sabbaticals, time away to recharge, work on projects, go to new places and experience new things. The idea of this hit me hard a few months ago. I really liked the concept of it for describing sort of how this space will be and what I wanted to accomplish with it. We do need to stop, step away at times, try new things, talk to people so we can recharge our creative batteries. While I a do this for myself and document it here I hope you get something out of it too. My passion for photography has grown immensely over the years through doing all of the product photography and photos for my businesses and blog. I have an eye for detail and design and will be expanding my business to offer styled and product photography and branding consulting for creatives. I love working and networking with other small business owners. Look for those tabs to be added to my menu bar soon. 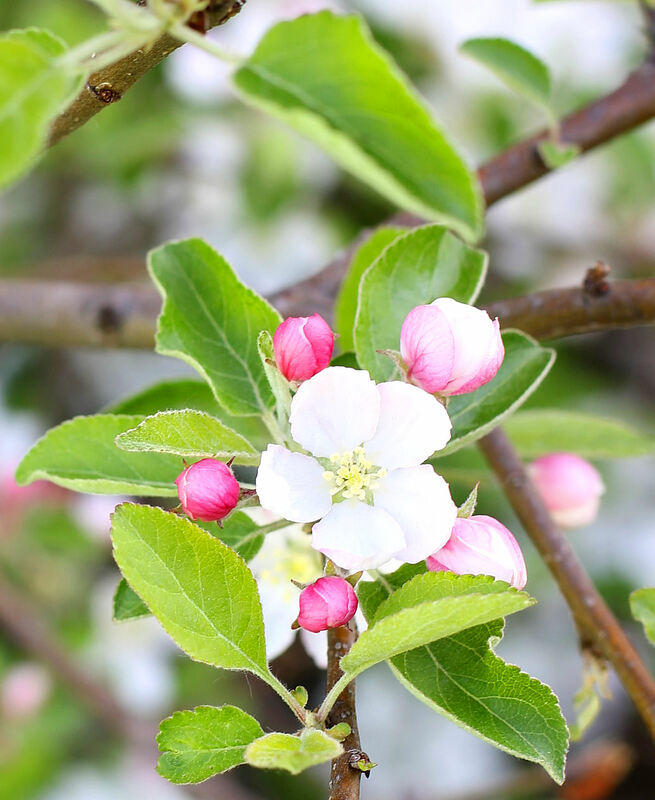 This spring I enjoyed watching the apple trees in my yard bloom. I captured the blossoms through the stages of opening and thought about how it related to those running creative small businesses. You have the idea, it might be small to start just like the bud of the blossom. For it to bloom into something bigger it needs sun and water. It then opens to become a beautiful flower and through more help from bees it then turns into an apple, expanding even more. Our businesses and ourselves need time to go through different stages and along the way help is often needed. Here is where I hope you can find resources and inspiration to get you through some of the growing stages so that you and your business can bloom and turn into something even more magnificent!